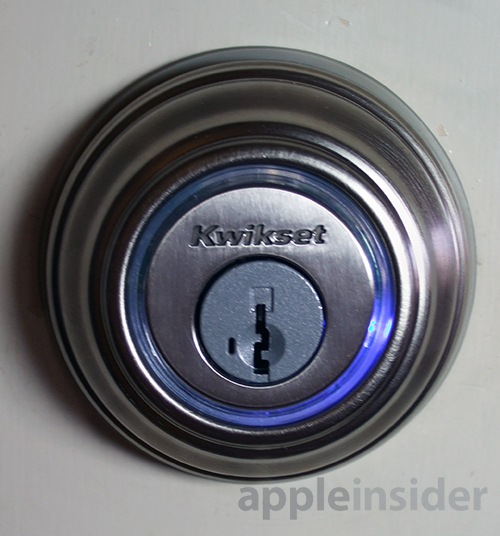 Back in May, AppleInsider reported on Kwikset's Kevo unveiling, noting the home security device would use advanced wireless technology from startup UniKey, affording users unprecedented security management through the use of digital "eKeys." Unlike physical keys, eKeys are difficult to copy and can be revoked at any time. For example, permanent eKeys can be sent to family members, while time-based permissions are available for others, like maids or babysitters. Over the past week, we were able to spend some time with a final Kevo production unit to test Kwikset's claims of easy security management, and to see if the device would be any more useful than a plain old set of keys. 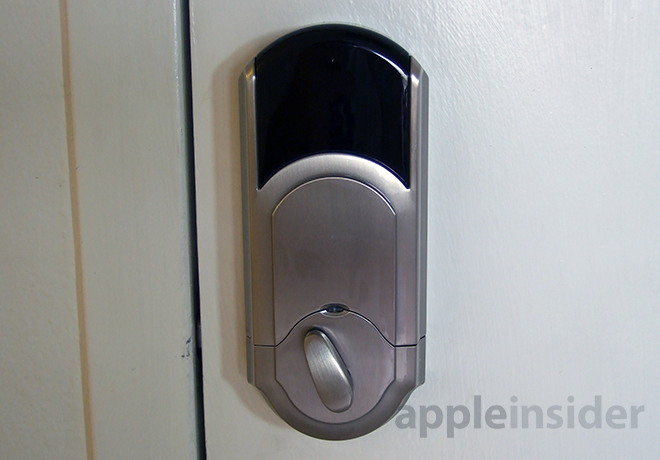 From the outside, Kevo looks almost identical to any other deadbolt setup. 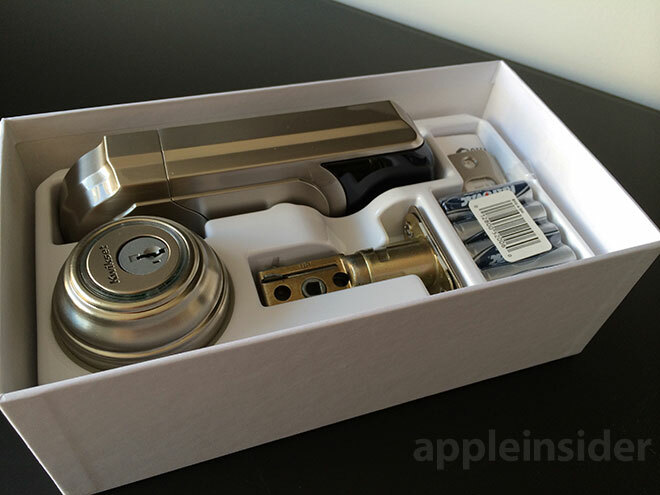 The simple "rose," or outer portion of the deadbolt assembly, is made of metal —finished in either Lifetime Polished Brass, Satin Nickel, or Venetian Bronze —and matches up well with lock sets made by other brands. When Kevo is not active, only a close inspection will reveal that it's no ordinary lock. The rose, which protrudes from the door no more than a regular deadbolt, is touch-sensitive and is the main mode of interfacing with Kevo. Without this functionality, say if the lock's batteries run dry, users are relegated to using the provided hardware keys like a traditional deadbolt. 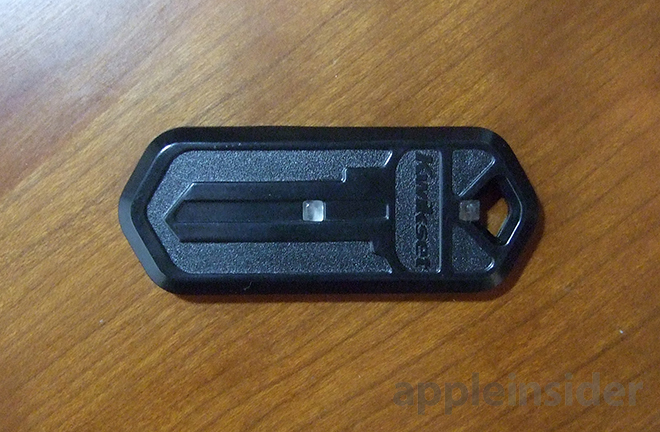 That small slit just to the left of the keyway is used for Kwikset's Smartkey re-key technology, which allows the lock to be reconfigured with a new set of physical keys. At least one of the original keys is required to first unlock the mechanism before re-keying. The method can be thought of as a more secure version of reassigning a personalized number to a push-button luggage lock. One thing that will likely go unnoticed, even to those with a keen eye, is the cylinder's face plate, or the area surrounding the keyway. 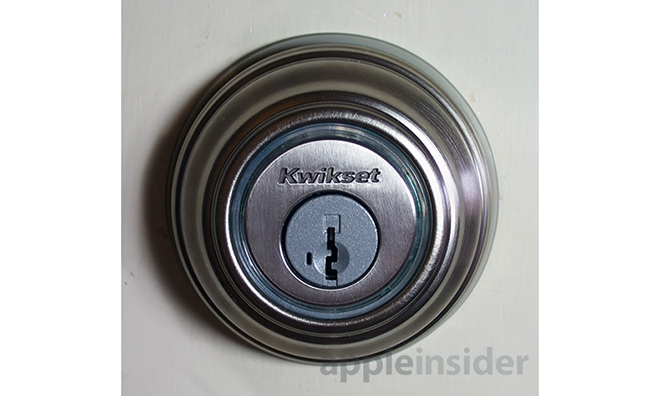 Kwikset experts told AppleInsider that the component is not actually pure metal, but is instead a hybrid metal/plastic material used to enhance radio transparency for the device's built-in antennas. Kevo's electronic guts are housed within a fairly large shell located on the interior side the door. As seen above, the unit is definitely larger than a regular lock assembly. 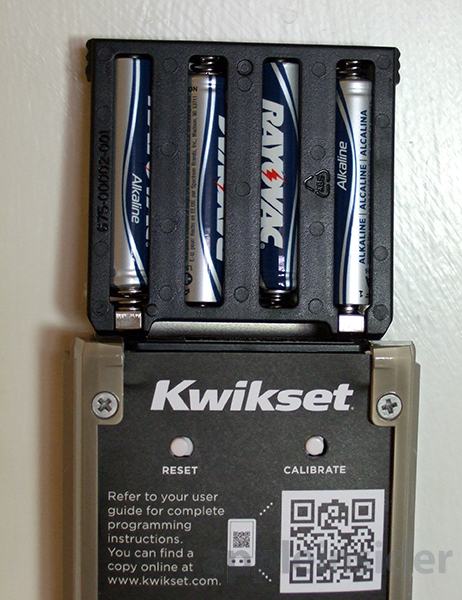 The indoor portion of Kevo also holds the reset and calibration controls, a removable cage with room for four AA batteries, bolt motor and the PCB, among other electronics. At the bottom of the housing is the interior turnpiece to lock and unlock the mechanism, while the brains are located in a plastic shell just above. The black portion of the removable cover aids in radio transmission. Given the build quality of the exterior rose, we were disappointed to find so much plastic used on the parts located inside the house. To be clear, the functional components, like brackets, spacers and latch bolt, are all made of strengthened metal, but the housing is largely plastic. Particularly, the back cover feels like it could easily break after extended use. Finally, while not a gripe, the user interface is typical of industrial products. That is to say the design is all function, no pizazz, with exposed circuitry and rudimentary labeling. 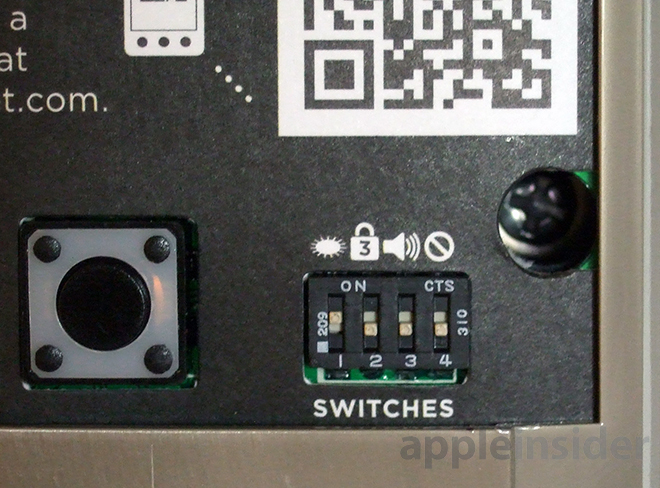 Toggle controls for sound and other functions are even routed through a DIP switch. We have no qualms about the design, in fact, we like to keep it simple, but some consumers may be turned off by the lack of polish on a relatively pricey kit. Aside from looking like a traditional deadbolt (at least from the outside), Kevo is compatible with most doors, meaning no special tools beyond a screwdriver are needed for installation. 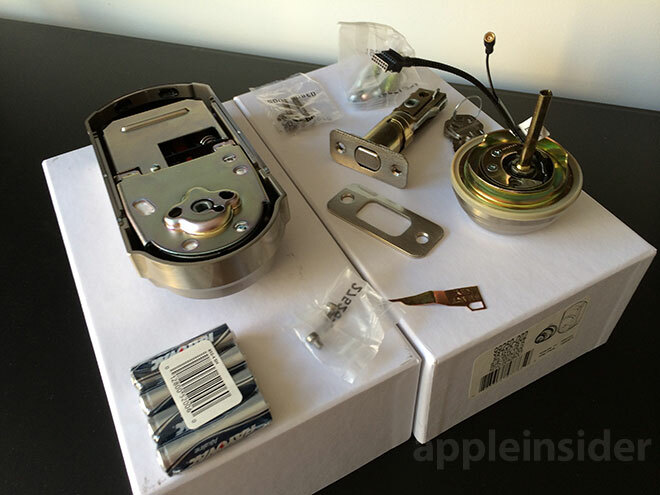 It should be noted that the lock was not fully-compatible with a hollow steel door located in a Midtown Manhattan apartment building —our first attempt at an installation —that currently employs an external deadbolt on the inside of the door. 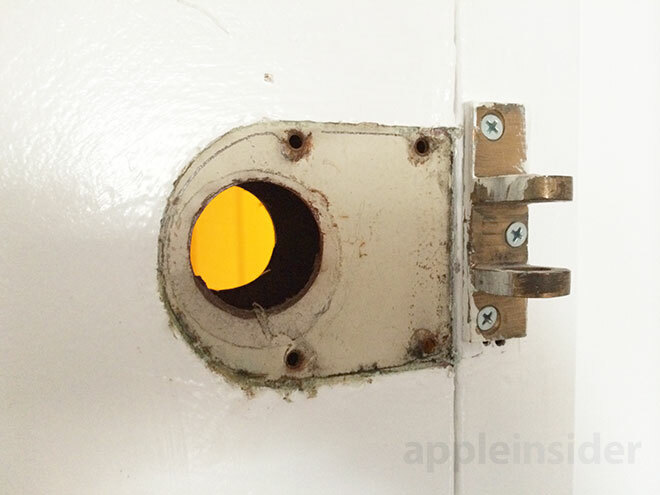 To be sure we could not use the device on a hollow steel door, we called a locksmith. The locksmith said he was willing to install the Kevo if we really wanted, but would not recommend it because he could not guarantee the work because the structure of the door (below) would not provide the proper support for the deadbolt mechanism. Buyers should check specification requirements prior to buying, but compatibility is nearly identical to most traditional deadbolts on the market. In most other cases, installation on an an existing, solid door that currently has the same style deadbolt is fairly painless. It's about as simple as any other deadbolt, the only difference being a bit of wire routing and positioning of the housing's interior bracket. It took us a little over five minutes to remove our old lock from a different door and put in Kevo. For reference, this door —located some 5000 miles away —is a solid core wooden door with separate cutouts for a handle and deadbolt. This unit also features a steel door frame with integrated door strike, though installation would be identical for houses with a wooden frame and screwed-in strike plate. Kwikset supplies all the necessary hardware to get Kevo installed for doors with thicknesses of 1-3/8" or 1-3/4" and the latch assembly is adjustable as well. Also included is a 24-step installation and setup guide. After getting everything hooked up and batteries installed, we decided to activate and enroll the provided Kevo Fob first. The small device holds a Bluetooth Low Energy transceiver and an LED that lights up green when Kevo is successfully locked or unlocked. 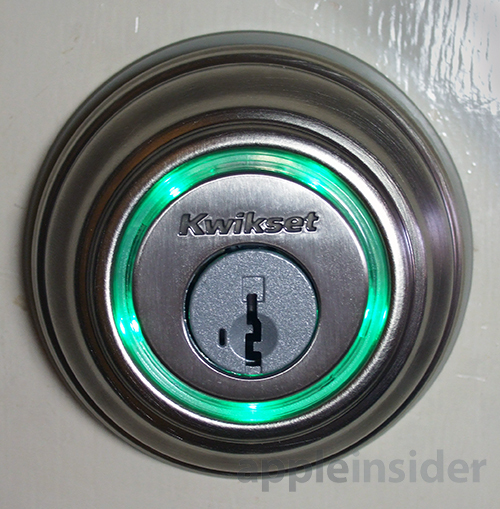 An accelerometer or other motion sensor is also on-board, as Kwikset says the fob saves energy by putting itself into sleep mode after 30 seconds of non-movement. By pressing the Program button on Kevo's interior housing, users can enroll both fobs and iPhones. A total of eight separate fobs can be enrolled on one Kevo lock, while a single fob can be enrolled on as many as 25 different Kevo units. After we confirmed the fob was operable, we downloaded the Kevo app on our iPhone 5s and proceeded to setup the phone using the same method. 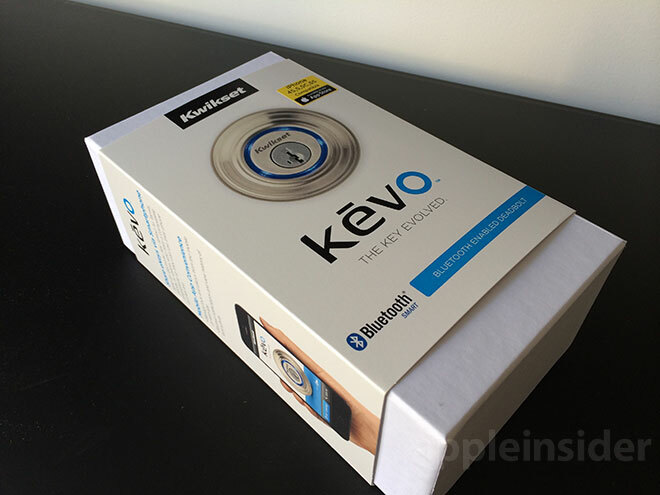 A major security feature being touted by Kwikset is Kevo's so-called "inside-outside" fob and smartphone recognition, which intelligently detects whether a verified user is currently inside or outside their house. 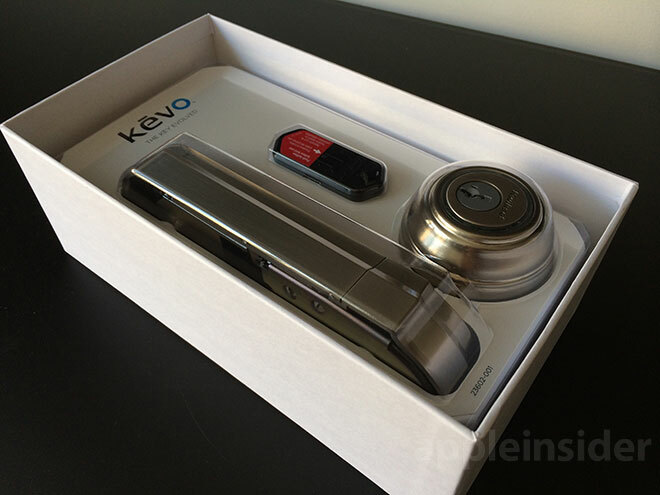 If an authorized device is known to be inside the house, unauthorized users are unable to activate Kevo from outside. Further, Kevo won't blink magenta to signify that a fob or iPhone is out of range, something that could alert an intruder to the homeowner's absence. The system acts as a one-way filter that lets only authorized users pass through the entryway. 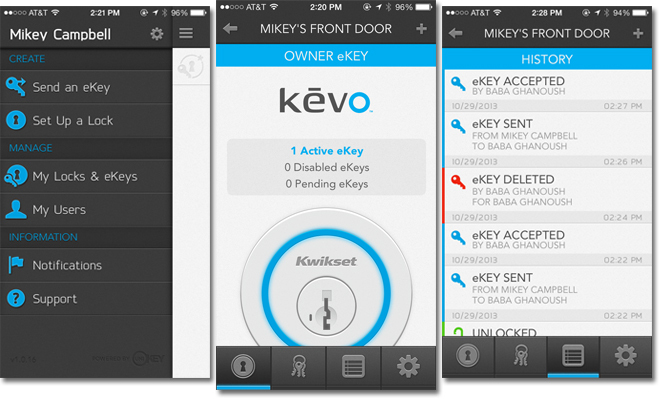 Kevo samples eKey radio signal strength on both sides of a door to determine if a user is inside or outside the house. To enable the feature, Kevo relies on an antenna array that picks up Bluetooth radio signals on both sides of the door and measures their strength against a calibration setting. Because radio waves can pass through solid material, Kwikset had to fine tune Kevo to create a foolproof system. In order to use inside-outside, users must calibrate Kevo by standing outside the door and touching the rose three times while keeping the fob or iPhone in a pants pocket or purse. The digital key must be in line-of-sight to be recognized. Once an acceptable reading has been logged, Kevo will save the signal strength data to refer to the next time someone tries to activate the lock. If the key is outside the calibrated parameters, the LEDs will flash either red or magenta to signify an error. The feature proved to be extremely sensitive, and we had to recalibrate our iPhone twice to achieve a range that worked well. This is a good thing, though, as inside-outside is built for protection, not convenience. In our tests, we found Kevo would not activate from the outside even when an authorized iPhone was positioned directly on the other side of the door. Further, the calibration settings are device-specific, meaning the inside-outside feature will not be enabled for non-calibrated keys. Another benefit of having a digital set of keys is that they can be shared remotely. 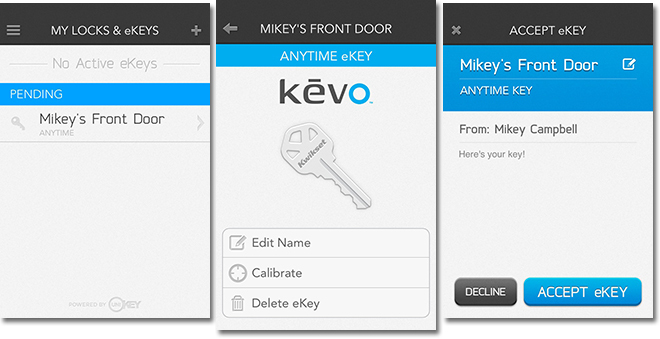 For our tests, we sent a variety of eKeys to another device via the Kevo app. 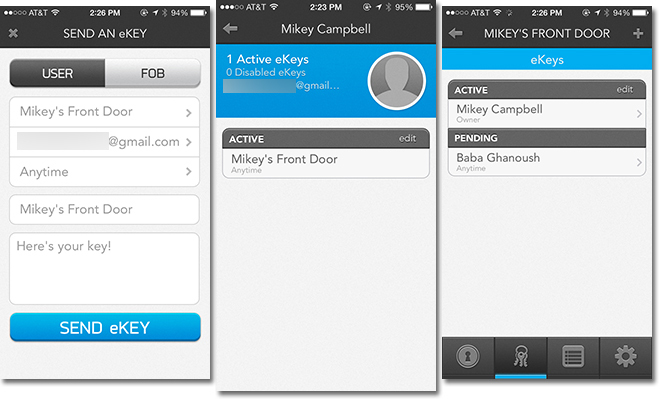 Secondary users can accept or deny the invitation and, depending on the type of permissions granted, send their own eKeys to other people. It should be mentioned that only the first eKey is free. Each subsequent digital key costs $1.99. Kevo's app as seen on an owner's iPhone. eKey access can be set to three levels: time-limited, anytime, or admin. Kevo owners can disable or delete distributed keys at any time. This is where we ran into a minor security issue. Because Kevo is not Internet-connected, eKey deletion tokens must be sent to the second device when an owner wants it deactivated. This means a user with "anytime" permission can simply turn off cellular data or Wi-Fi and keep the key indefinitely. Of course, they would have to know when the eKey was being deleted and keep their phone off-network. As a precautionary measure, UniKey, which handles the eKey servers, pushes out a constant delete message, so that any time the second device reconnects, its permissions will be invalidated. In addition, the primary user can simply reset the Kevo unit manually, wiping out all generated eKeys. Accepting an eKey on second device. Owners who don't need to share can simply rely on the included fob and forego the iPhone integration altogether if needed. As mentioned above, up to eight can be associated with one Kevo, and Kwikset sells them as accessories. When we first installed and used Kevo, the locking mechanism's noise was surprisingly loud. There was also some trouble with out-of-range and inside-outside errors when using the iPhone's eKey. Initially, we thought the handset's radio signal was reflecting off a wall inside the house, near the door, but a quick recalibration proved the original settings were performed too close to the lock. Recalibrating one step back from the door gave a better signal reading for Kevo to parse, resulting in nearly flawless operation thereafter. There is a definite lag time between touching Kevo and unlocking the door. Following the recalibration procedure, we were able to keep the iPhone in our pocket or bag and open the door without issue. In our test case, a handle lock was used alongside the deadbolt. Instead of unlocking both with physical keys, our habit was quickly modified to touch the deadbolt rose upon arriving at the door, then unlocking the bottom handle while Kevo authenticated our phone and unlocked itself. There is a definite lag time between touching Kevo and unlocking the door. Spinning blue lights appear when the unit is thinking, and it can take a few seconds to establish a link with your iPhone to authenticate the eKey. We timed it to be an average of three seconds slower than operating the lock manually. After becoming aware of Kevo's limitations, the lock has become just another part of our daily routine. While motor noise is still present, we believe it's no more bothersome than a set of rattling keys, and the lag time becomes less of an issue when carrying 20 pound's worth of groceries. As a side note, we also turned off the optional on-board chimes because they were a tad too loud. After using Kevo for over a week, we can't say that it's a life changer. But then, Kwikset never set out to start a revolution. What Kevo does is make life a little easier and, like any good product, doesn't cause frustration by being poorly executed. It does what it says on the box. There are similar devices coming to market that feature Internet connectivity, remote access and a host of other bells and whistles, but security risks may outweigh any perceived benefit. As it stands, Kevo's Bluetooth LE capabilities and encrypted eKeys are still vulnerable to attack, though much less so due to its isolation from the Web. It would be easier for an intruder to enter through a broken window than hack Kevo's crypto. If you're willing to accept the somewhat small security risk, as well as some minor quibbles we had with the plasticky housing and finicky calibration method, then Kevo is worth a look. Kevo hit the market this week in three different finishes, all of which are currently in stock at Amazon for $219.